The US state department says it understands that a number of Americans are among a group arrested in Haiti. Local media reported semi-automatic weapons had been found but this has not been officially confirmed. The circumstances remain unclear but local authorities told CNN the Americans were being held on conspiracy charges, but are not yet indicted. The arrests come amid nearly two weeks of protests against President Jovenel Moïse. The reason for the group's presence in the country also remains unclear and no identities are yet confirmed. Haiti's police did not respond when called by the BBC. But Inspector Gary Desroisiers, a deputy spokesperson for the national police, told news agency Haiti Libre the group had "refused to speak". 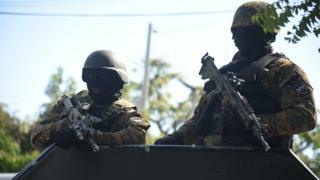 The group, said to have eight members, was detained in the country's capital, Port-au-Prince, on Sunday. Local media reported that the members of the group were driving two vehicles without registration plates and were arrested at the Rue des Cesars. A police source told Le Nouvelliste newspaper that the men had said they were working for the Haitian government. Haiti Foreign Minister Bocchit Edmond told CNN that five American citizens and a Haitian national were among those arrested. The state department would not confirm any numbers. Local media report that a Serbian citizen and a Russian was also part of the group. Since 7 February, thousands of people have been protesting in Haiti over soaring inflation and allegations of government corruption. Opposition groups are demanding an investigation over claims that officials and former ministers misappropriated development funds from an oil deal signed between Caribbean countries and Venezuela. Last week he rejected the calls, saying he would not leave the country in the "hands of armed gangs and drug traffickers".